Yesterday, it was a real pleasure to take the afternoon off from work and head to my local Jo Ann's to attend Knitting 102: Baby Hat. 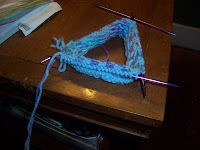 I wanted to learn how to knit on double pointed needles and how to add additional colors in knitting. After quite a bit of fudging, I managed to get 60 stitches evenly distributed between 3 of the double pointed needles. You arrange them in a triangle and knit through them consecutively. Then comes the frightening part. You have to actually knit the stitches with a 4th needle, one that my friend Karen calls the "naked needle." Like other things that get naked in public, this guy causes quite a bit of trouble. I found it very awkward to be attempting to hold on to so many needles at one time. And I'd drop the naked needle, or worse, I'd forget about him entirely, and just start knitting on the 3 existing needles causing an ugly situation to unfold in my triangle. Additionally, we were knitting with multiple skeins of yarn at once, to create a pretty pattern in the hat of alternating solid and multi-colored patches. Apparently, in kntting, you can carry different strands of yarn with you throughout your project. This sounds all cozy, but my triangle was not a happy home with all of these different yarn strands competing for my attention. And worse, they'd get all snarled up on the table in front of me. Pretty soon, my area of the table looked more congested than rush hour traffic in Atlanta. I had to keep stopping in order to untwist yarn and clear up some space. I'm knitting along, and suddenly, I hear the sound that all knitters dread: the sound of a tinny, teeny, tiny needle hitting the floor. I freeze in horror. Dropping your crochet hook is no big deal. The worst that could happen is that you have to re-do your current stitch. In knitting, a dropped needle can mean that many multitudes of stitches are on the verge of absolute obliteration. I panic. I look down, and quickly realize that I (once again) neglected one of my needles, and in protest, it slipped out, leaving 20 stitches in peril. I grabbed it and attempted to stuff the stitches back on quickly, before one of them could unravel. Miraculously, I managed to actually do this. Neither yarn nor needle was too crazy about the process, but they complied, and my hat was able to continue on. By the end of the class, I had completed 7 rounds, and I was pretty pleased. It's not perfect, but it's not bad. I'm hoping to make multiple editions of this guy to make lots of baby gifts. Excited. I need to not drop any stitches though; because I don't know how to fix them.